Working for a variety of commercial clients and industries across Medway, Sussex, Surrey, Kent and London, including pubs, hotels, clubs, schools, letting agents, care homes and landlords, we provide comprehensive drain repair, unblocking, cleaning and maintenance services. In business, time is money, so blocked commercial drains can be one of the worst things to happen, especially if you deal with the public regularly for example in restaurants, hotels or bars. Our range of drain unblocking, repair and replacement services enable us to cope with any commercial drainage problem, so no matter how challenging the situation, we can help. Call us today on 0800 781 8922 to arrange your FREE property survey and no obligation quotation. JLH Drains has successfully completed drainage work for many types of businesses. For over a decade we have provided our specialist expertise for business owners that require drainage repairs and maintenance. With the most up to date solutions including no-dig drain repairs, drain re-lining techniques and CCTV drain surveys we can also ensure costly and time consuming excavations are avoided whenever possible. Our skills and experience mean we are able to assist with any commercial drainage solution, so no matter what repairs, replacement, cleaning or maintenance needs to be carried out, we’ll be able to help. We’re the best choice for fast, efficient and reliable commercial drain repairs whether you’ve got a simple blocked toilet or a mystery cracked pipe buried in the ground leaking waste. Based at five sites across Kent, the South East and London we are able to provide fast emergency call outs we cover London, Gillingham, Chatham, Rochester, Strood, Maidstone, Sidcup, Dartford, Gravesend, Sittingbourne, West Malling, Orpington, Bexley, Woking, Farnham, Leatherhead, Guildford, Sheerness, Crayford, Sheppey, Margate, Herne Bay, Ramsgate, Faversham, Crayford, Surrey, Sussex and Medway. 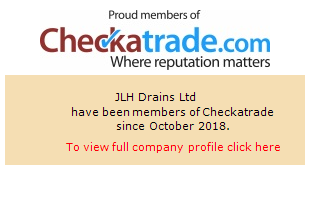 No matter what requirements you have for commercial drain unblocking or repairs, re-lining, CCTV drain surveys, cleaning or fault finding, put it in the hands of the specialists at JLH Drains; contact us today to arrange a no obligation survey and quotation with one of our experienced engineers.